My 16 month old adores crayons. If he spies a crayon in action, he runs up, eager to join in on the fun. Unfortunately, not all crayons are great crayons for toddlers. With the typical crayons we were using, this ended in broken pieces, frustrating him and upsetting his older brother (whose crayons were the ones breaking). Switching to Crayon Rocks has solved that problem for us. 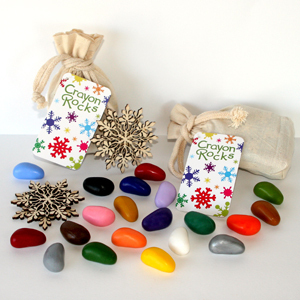 The rounded pebble shape of the crayons is a great match for small, chubby, hands and fingers. As we color with these crayons, in addition to the pride of creating their art, my children are working on their fine motor skills. And one of my absolute favorite things about the set is that they are made with natural wax and tinted with mineral powder. I feel better knowing that the products my children are handling are non-toxic and environmentally friendly. Disclosure: Stubby Pencil studio also sent me a set of Crayon Rocks to review. As always, I only recommend products I believe in and use in my home.